Green leaves form dense clumps to about 12 inches high; flower stems with green and silvery flowers rise to 24 inches. 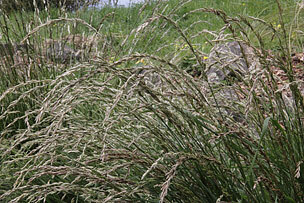 This bunchgrass is similar to small-flower melic grass, Melica imperfecta, but is larger in leaf and a little larger and taller in flower. It occurs throughout California and into Oregon on rocky hillsides, in oak woodland and conifer forests. The rich green leaves and tidy habit provide a nice accent in mixed plantings. Summer drought will encourage dormancy.